We're all a bit stupider-er to day, but we're still smiling. I don't know why I'm posting this except that it's the sort of thing you'd expect to be forwarded in a really bad email chain. ...Bubba, a 22-pound leviathan of a lobster pulled from the waters off Nantucket, Mass., and shipped to a Pittsburgh fish market. "It is overwhelming," owner Bob Wholey said. "If you see it, you will never forget it. Customers are just in awe." On Tuesday, Wholey gave the lobster to the Pittsburgh Zoo & PPG Aquarium, which will send him to an aquarium at a Ripley's Believe It or Not museum. 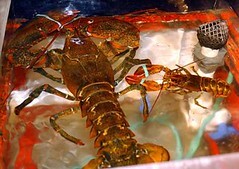 Another group calling itself People For Eating Tasty Animals reportedly offered Wholey a hefty price for the lobster. At Tuesday's price of $14.98 a pound, Bubba would retail for about $350." Bubba or his brother at least could have been mine. MMmm... Mmmm.. Good.